I just realized it has been way too long since I shared a recipe with you. I have just been having so much fun playing this summer that I really haven’t spent too much time in the kitchen. We are getting ready to head out of town for another long weekend of fun, and I needed to use up some ingredients so I decided to make a new recipe based on what I needed to get out of my fridge. And guess what? 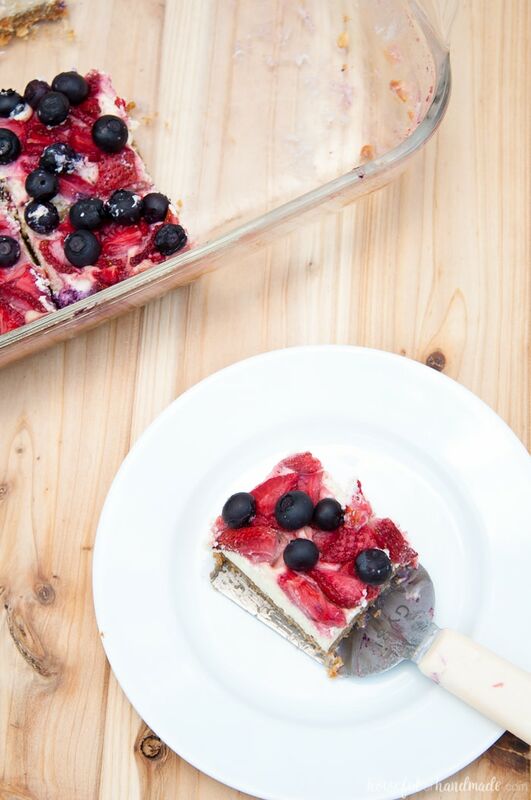 It’s awesome so I thought I’d better share this delicious oatmeal berry cheesecake bars recipe (and it helps me find the recipe when I want to make it again). This recipe is a necessity recipe. I was trying to clear out our fridge before leaving on a long weekend trip. I bought a bunch of strawberries and blueberries to go with our yogurt and granola while camping last weekend, but apparently I wasn’t the only one with that idea and we ended up having a lot of berries. So unfortunately we came home with a lot of berries. I also had 6 lbs of cream cheese in my fridge! How does one end up with 6 lbs of cream cheese you ask? Well, I sent the hubby to Sam’s club for a few other groceries, but I had just made him pumpkin cookies and he wanted cream cheese frosting. The 6 lb cream cheese was only $10 so I told him to just go for it. I was sure I would be able to use it up (famous last words). 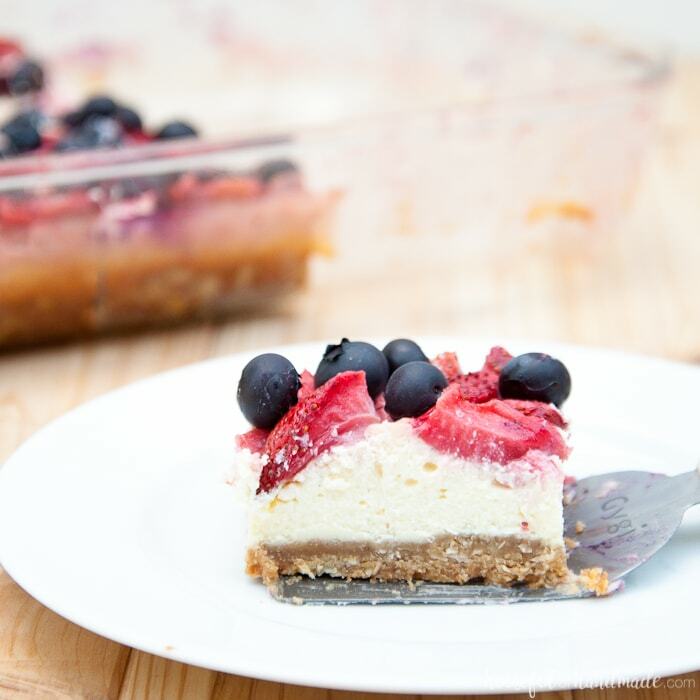 So when you have a fridge full of berries and a giant brick of cream cheese you definitely need cheesecake. 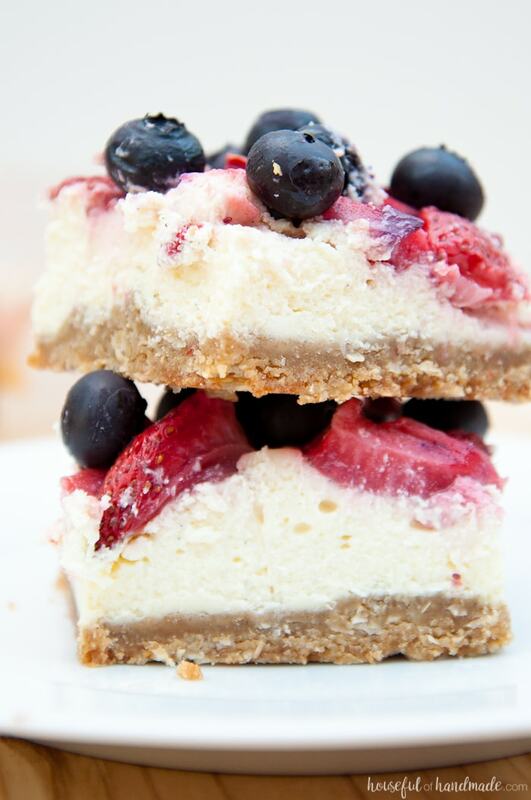 And since we are heading out of town for a fun weekend with my family, I figured cheesecake bars were the best way to clear out my fridge for the weekend. I had also just been experimenting with my wheat grinder and grinding up some oat flour, so I figured I would add some oats into the mix too. What I ended up with was absolutely delicious! I think I need to try this “What’s in the fridge” game more often. If you need a gluten free option, using gluten free oats and oat flour will make this the perfect gluten free recipe for your summer barbecues. 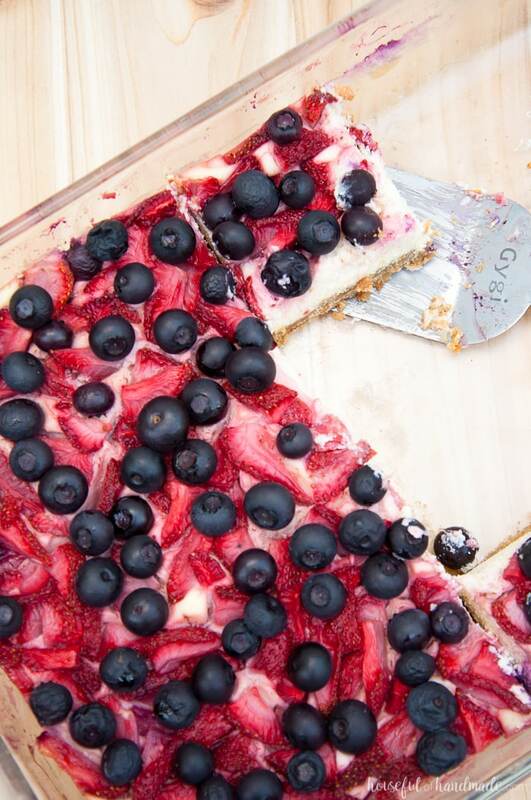 Delicious, full of fresh berries, and gluten free, sign me up! Cut up the strawberries. Place in a bowl and sprinkle with the sugar. Stir and set aside to let the strawberries get juicy. Pulse the oat flour, butter and brown sugar in a food processor until crumbly (or you can use a pastry cutter or two forks). Add rolled oats and pulse just until combined. Press into the bottom of a 9x13 inch baking pan. Bake until the edges start to brown, about 15-20 minutes. While the crust is baking, cream together the cream cheese and sugar until fluffy. Mix in eggs, one at a time, making sure to scrape the sides and paddle well after each egg. Mix in vanilla bean paste. Pour over hot crust and spread evenly. Spread strawberries and juice over the top and sprinkle with blueberries. Bake until the center is firm, about 50-60 minutes. Remove from oven and allow to cool then refrigerate until set, about 2 hours. 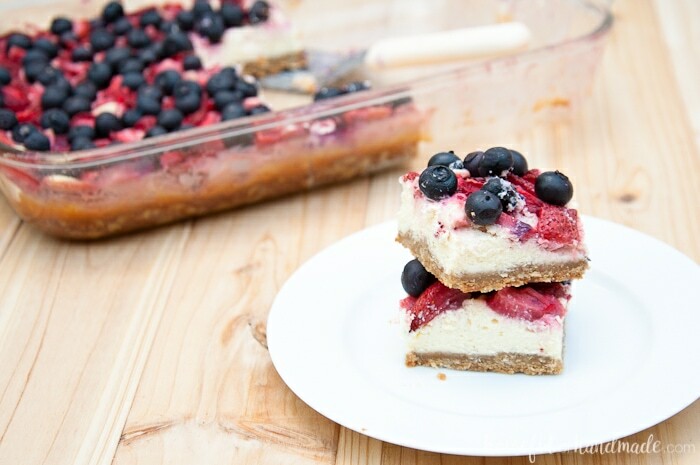 These cheesecake bars look so flavorful. Thanks for sharing the recipe. Thanks. They are quite delicious! Boy! These would be great to bring along for a picnic! Yummy! It’s only 9 am, but I could SO go for a bar (or two!) of this goodness! 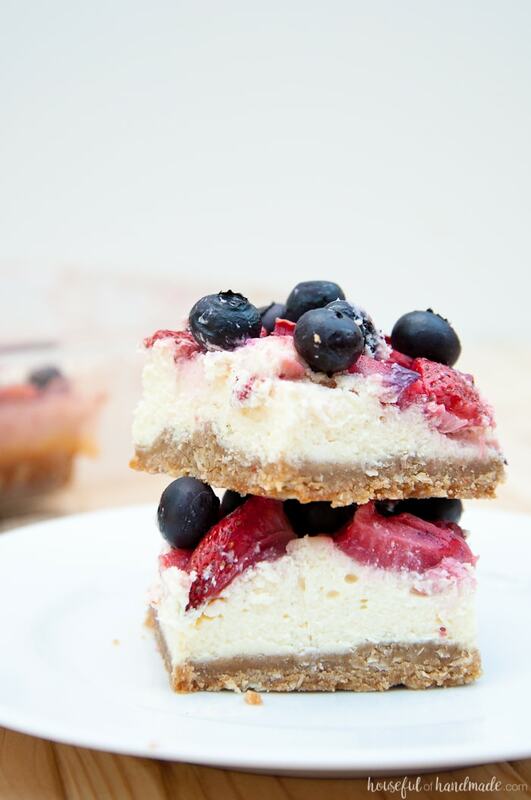 Cheesecake bars are my favorite because they are so much easier to make than an actual cheesecake. I love the oatmeal crust idea. This sounds so so so good! Seriously, there is fruit and oatmeal with these so they are practically a breakfast food 🙂 Cheesecake bars are definitely easier to make and still delicious!